I saw some totally awesome mittens at No Coast Craft-o-rama this month. I didn't buy them because I just got a new pair of gloves, but now I can't stop thinking about them. 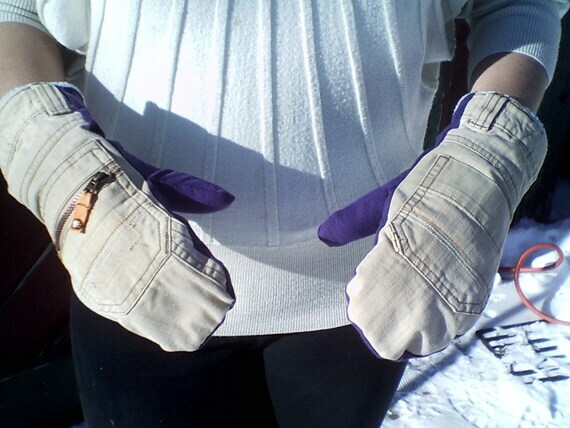 Breaksea Upcycle's makes mittens locally using recylced pants, and so the mittens have a handy pocket! The pair I tried on were all cozy and fleecy on the inside, and I was like "OH SNAP! These are some awesome mittens!" I tried them on, took them off, walked away, walked back, tried them on again, looked at them longingly, and then walked away again. If you're like me and saw them, and still want them, you can buy them on their website, or locally at I Like You, The Wedge, and Seward Co-op.